The Print Production Work Orders application prints the physical work orders that instruct the production department what to produce. These orders may have been entered in the Production Order Entry application or copied from Customer Order Processing through the Copy COP Orders Into BOMP application. A work order need not be printed before BOMP will allow production for the order to be reported in the Production Transaction Processing application. However, once a work order has been printed or had production reported, it may no longer be changed or deleted in the Production Order Entry application or in COP. For more information on modifying and deleting orders copied from COP, see the Package Overview section of this manual. If one of the Work In Process (WIP) options is selected, General Ledger distributions will be generated in the I/M Distribution To G/L File. Credits will be created for the asset account associated with the feature option and/or component items as well as an offsetting debit to the work-in-process account number specified in the BOMP Setup application. If the user sets the Increase WIP? to Y, components' quantity on hand and allocated in the Inventory Item File can be reduced immediately. The user may choose to print work orders for one or all locations, and also may define a range of order numbers to print. The user must specify a cutoff for order start dates. Orders with start dates after that date will not be printed. The user must decide whether to allow work orders to be printed more than once and also how many product structure levels to explode. 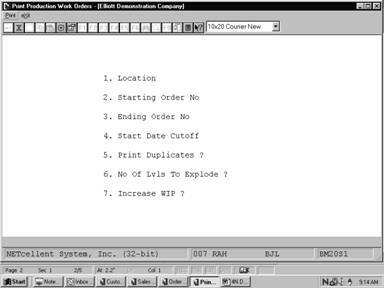 * Select the desired mode from the Print Production Work Orders menu bar. Enter the location for which work orders are to be printed. Defaults to All. Enter the starting order number for the range of work orders to be printed. Defaults to All. Enter the ending order number for the range of work orders to be printed. Defaults to the starting order number. Enter the cutoff for order start dates. Only orders with start dates on or before this date will be printed. Entry is required. Enter Y to allow the reprinting of work orders. Enter N to only include work orders which have not been previously printed. Defaults to N.
6. No Of Lvls To Explode? Enter the number of product structure levels to be shown on the work orders. Enter 11 to show all levels. Defaults to 11. Valid entries are Y, W, or N.
Enter Y to create credit distributions in the asset accounts for raw materials required to complete the order. An offsetting debit distribution will be created for the Work In Process (WIP) Account entered in BOMP Setup. Also, on-hand and allocated quantities will be reduced in the Inventory Item File. Enter W to create the asset and WIP account distributions but not affect inventory levels. If Y or W is entered, when production for the order is entered and posted the WIP Account will be appropriately credited and the Finished Goods Asset Account will be debited for the items produced. Enter N to not use the WIP feature. If N is entered, asset account distributions and inventory level adjustments will not be made until Production Transactions are posted. Also, no WIP Account distributions will occur.